Amid the current media frenzy about Somali pirates, it’s hard not to imagine them as characters in some dystopian Horn of Africa version of Waterworld. We see wily corsairs in ragged clothing swarming out of their elusive mother ships, chewing narcotic khat while thumbing GPS phones and grappling hooks. They are not desperate bandits, experts say, rather savvy opportunists in the most lawless corner of the planet. But the pirates have never been the only ones exploiting the vulnerabilities of this troubled failed state  and are, in part, a product of the rest of the world’s neglect. trawlers,” says Peter Lehr, lecturer in terrorism studies at Scotland’s University of St. Andrews and editor of Violence at Sea: Piracy in the Age of Global Terrorism. The names of existing pirate fleets, such as the National Volunteer Coastguard of Somalia or Somali Marines, are testament to the pirates’ initial motivations. The waters they sought to protect, says Lehr, were “an El Dorado for fishing fleets of many nations.” A 2006 study published in the journal Science predicted that the current rate of commercial fishing would virtually empty the world’s oceanic stocks by 2050. Yet, Somalia’s seas still offer a particularly fertile patch for tuna, sardines and mackerel, and other lucrative species of seafood, including lobsters and sharks. 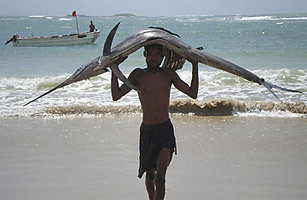 In other parts of the Indian Ocean region, such as the Persian Gulf, fishermen resort to dynamite and other extreme measures to pull in the kinds of catches that are still in abundance off the Horn of Africa. High-seas trawlers from countries as far flung as South Korea, Japan and Spain have operated down the Somali coast, often illegally and without licenses, for the better part of two decades, the U.N. says. They often fly flags of convenience from sea-faring friendly nations like Belize and Bahrain, which further helps the ships skirt international regulations and evade censure from their home countries. Tsuma Charo of the Nairobi-based East African Seafarers Assistance Programme, which monitors Somali pirate attacks and liaises with the hostage takers and the captured crews, says “illegal trawling has fed the piracy problem.” In the early days of Somali piracy, those who seized trawlers without licenses could count on a quick ransom payment, since the boat owners and companies backing those vessels didn’t want to draw attention to their violation of international maritime law. This, Charo reckons, allowed the pirates to build up their tactical networks and whetted their appetite for bigger spoils. Monitoring and combating any of these misdeeds is next to impossible  Somalia’s current government can barely find its feet in the wake of the 2006 U.S.-backed Ethiopian invasion. And many Somalis, along with outside observers, suspect local officials in Mogadishu and in ports in semi-autonomous Puntland further north of accepting bribes from foreign fishermen as well as from pirate elders. U.N. monitors in 2005 and 2006 suggested an embargo on fish taken from Somali waters, but their proposals were shot down by members of the Security Council. In the meantime, Somali piracy has metastasized into the country’s only boom industry. Most of the pirates, observers say, are not former fishermen, but just poor folk seeking their fortune. Right now, they hold 18 cargo ships and some 300 sailors hostage  the work of a sophisticated and well-funded operation. A few pirates have offered testimony to the international press  a headline in Thursday’s Times of London read, “They stole our lobsters: A Somali pirate tells his side of the story”  but Lehr and other Somali experts express their doubts. “Nowadays,” Lehr says, “this sort of thing is just a cheap excuse.” The legacy of nearly twenty years of inaction and abuse, though, is far more costly.